Who’s ready to get your gas powered speed on? If you’ve been to Magic Kingdom’s Tomorrowland, there’s no missing the huge and noisy Tomorrowland Speedway. Located next to Space Mountain and bordering the new Fantasyland, the Tomorrowland Speedway is one of the original rides since the Magic Kingdom park opened in 1971. Four lanes of two seater cars roll across a winding track. Along the way you’ll see familiar sites of Magic Kingdom such as Space Mountain, Cinderella’s Castle, Dumbo’s Flying Circus, Mad Tea Party, and you may even catch a glimpse of a passing Disney World train. 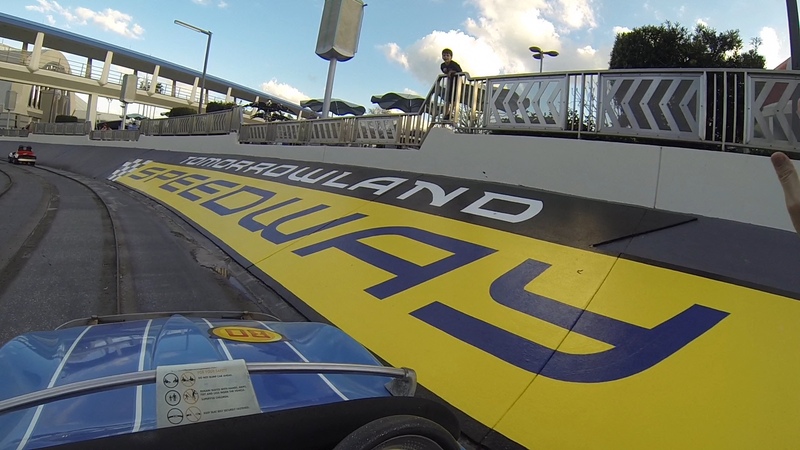 Here’s a video I shot of Courtney driving one of the cars of the Tomorrowland Speedway. I push the gas pedal as her legs are’t long enough yet, but you can tell she loves to steer the car. She’s got a bit of driving practice before she’s ready to hit the NASCAR circuit, though. This video was shot with a GoPro Hero 3 Black Edition with a GoPro head strap. I’m glad I had the camera positioned just right as I was able to capture the speedway as well as Courtney’s facial expressions as she was driving. As you can tell, she loves driving the cars at the Tomorrowland Speedway!